In my 13 years here at The Brew Lounge, I've never been much for simply copying/pasting press releases. 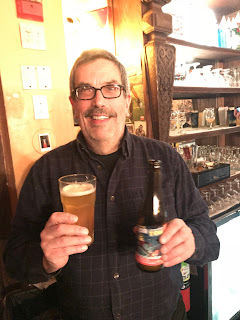 On average, I get a handful each day from breweries and promoters both here at home in the Philly area and from around the country. I may use this one from the famed Monk's Cafe here in Philly to change that going forward. We'll see how this goes, but this could be the first of carefully selected press releases that I share with you in the future. There's a lot of news out there and I owe it to you to share more often. This one's pretty special considering all the players and components to the story and the beer. The press release describes it all for you. All that's left is to try it. 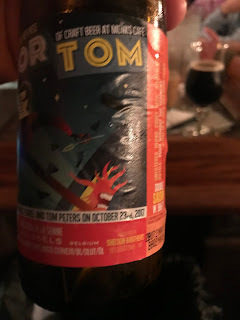 I had a sneak taste of it a couple of weeks ago during Péché Mortel/Orval Day at Monk's and I'm looking forward to more of it. You should as well. Santé! 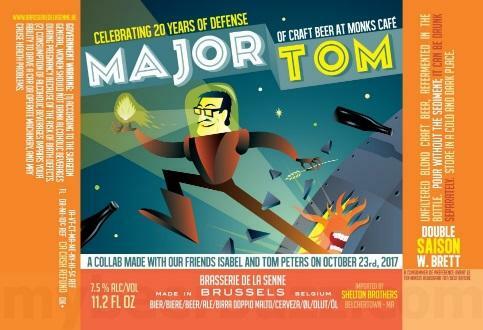 On Tuesday, April 10 at 5 p.m. Tom Peters – the “Godfather of Belgian Beer” and owner of America’s most iconic beer bar, Monk’s Café -- will debut his namesake beer: Major Tom, the first collaboration beer brewed between an independent bar and Belgium’s famed Brasserie de la Senne. 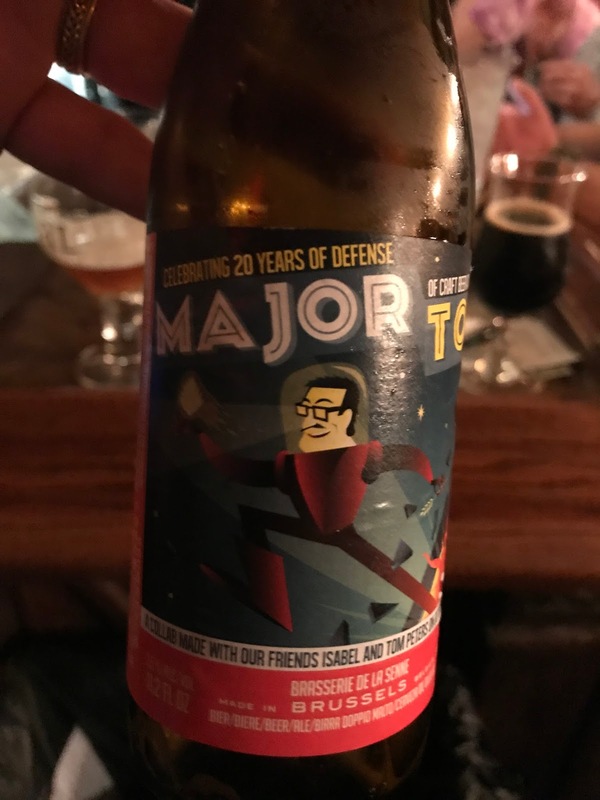 Major Tom is a Double Saison that is bottle-conditioned with a strain of Brettanomyces (the wild, bacteria-eating yeast) that was cultivated by Brasserie de la Senne. Major Tom will be available exclusively at Monk’s Café from April through June, in 11.2 oz. bottles, before additional cases arrive at the venerable Shelton Brothers importers for broader distribution across Pennsylvania and the rest of the country. 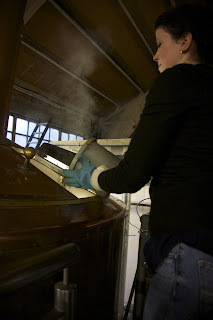 Peters and his 22-year-old daughter, Isabel Thomas-Peters, traveled to Belgium in October 2017 to brew Major Tom with Brasserie de la Senne co-owner and master brewer Yvan de Baets during an all-day brewing marathon that included everything from formulating the recipe and choosing the malt bill to selecting hops and grinding grains. Brewed with Beechwood smoked malt – another first for Brasserie de la Senne – they made Major Tom a refreshing, flavorful beer with a super-dry finish, accented by hints of subtle smoke and delicately hopped with Aurora and Perle. This special double saison spent two weeks fermenting in Brasserie de la Senne's signature wide, oval tanks, custom designed to minimize hydrostatic pressure stress on the hardworking yeast. Unlike typical tall, narrow fermenters that dramatically increase stress on the yeast, de Baets' shallow fermenting vessels preserve the beer's integrity throughout the brewing process. 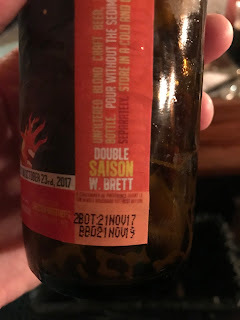 The finished beer has an ABV of 7.2%, which is not staggering by American standards, but makes it one of the strongest beers de Baets has ever brewed. The bottle’s label carries extra significance – and a bit of tongue-in-cheek pride – for Peters: aside from the nod to the hero in David Bowie’s classic hit Space Oddity, he brought his trademark boldness in the face of politics to bear by suggesting the design depict him exiting a space ship and breaking free of President Donald Trump’s unwanted advances.